We first met Amber back in January of this year, 4 months after we had opened our Etsy store. She had contacted us, complimenting our shop and suggested we partner with her as a sponsor. It's hard to believe it's almost been a year since that first encounter and we could not be more dazzled by her kind heart and unwavering support. It made perfect sense to feature Amber in our customer spotlight this month, not only because she purchased our fabulous vintage rooster but more importantly because she shares a personal perspective on interior design and what it means to follow your passion. Tell us a little bit about yourself ... I am Amber Balistreri, the voice behind the design blog, Simple Dwellings and the owner of Amber B Interiors, a boutique e-Design firm. When I’m not designing spaces, I am spending time with my hubby and two amazing kiddos, long distance running or trying to find some quiet time with a nice cup of coffee! How did you discover your style? My style has definitely evolved over the years! I still continue to grow and love so many design styles and I believe they can all work together. 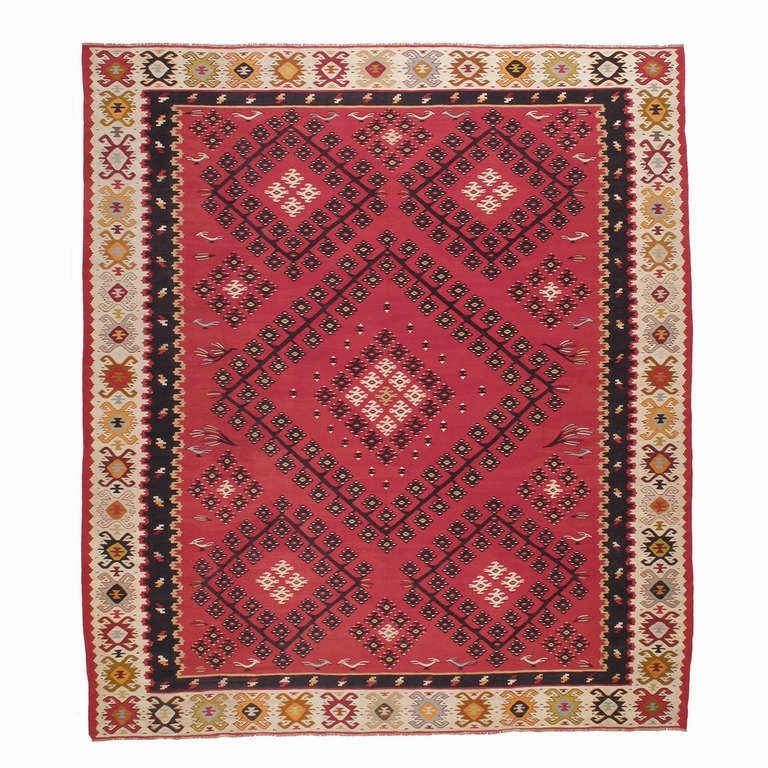 I would say my personal style is a blend of modern and traditional, with an eclectic edge. I like my spaces to feel as though they have evolved over time and I try to do that with a mix of the old and the new. I have a huge appreciation for things of the past and I believe that bringing those vintage elements into a space truly makes the home feel warm and lived in. I also believe that when a space reflects your individual style and has thoughtful, meaningful elements, it’s complete! You will be most happy in your space when you incorporate what matters most and when you bring your own personal style into the mix. I also try not to take my designs too seriously. A little touch of whimsy or the unexpected brings a room to life and makes the design so much more fun. What influenced you to start your own design business? My blog was really the jumping off point to my design business. I started Simple Dwellings in 2010 as a creative outlet and fun hobby. I have always loved design and with the kids in school, I knew I could devote more time to writing a blog. After several months, I started to create design boards for fun! I loved doing it, and to my surprise, readers started asking me for help. 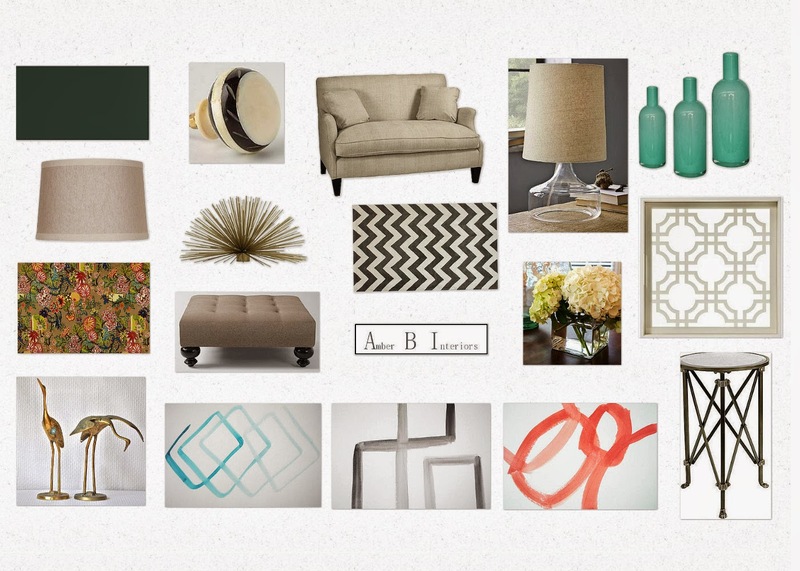 In the summer of 2011, after taking a few design courses, Amber B Interiors was open for business! The business is currently e-Design, where all design work is through on line correspondence. I love e-Design, because I can work with anyone, no matter where they live! You recently had the opportunity to meet with Sarah Richardson. Tell us about that experience and what was the biggest piece of advice she gave you? I am still pinching myself that I was in Sarah’s design studio, looking at her new fabric line, just last month! I was attending Blog Podium, a design and lifestyle blog conference that weekend and Sarah Richardson was the key note speaker. I was fortunate enough to meet her and her design team, before the conference. Her studio was amazing, inspiring and ridiculously beautiful! Sarah and her entire team were so fun, down to earth and easy to talk to. She truly is as sweet in person as she is on her HGTV shows. The best piece of advice she gave us, is to never give up on your dreams and work hard to achieve them. Even if one is not schooled in design (which neither myself nor Sarah are), you can make your dreams come true. That really resonated with me, because she inspires us self taught decorators to go after our dreams. Do you have a favorite home magazine or decor style book that speaks to your aesthetic? I love to read blogs daily, for design inspiration. Pinterest is another great source for ideas and getting my creativity to flow. It’s amazing the talent that’s out there and I love the willingness to share what works and pass it on! But sometimes, it’s great to sit on the couch with an inspiring magazine. I subscribe and love HGTV magazine. I think I love it because the designs are so relatable and the ideas can easily translate to our own homes. I also love Southern Living magazine and sometimes think I should have been born in the south! I love the relaxed way of life, style of homes they feature and also seeing the travel section for new places to visit. Maybe that’s why we took a trip to South Carolina this past summer!! What current home decorating trends can you identify with and which trends do you steer clear from? The trend that I can currently identify with is the love for brass! Brass has made a huge comeback and I think it’s here to stay, because of its nod to antiques and the past. I also love bold, graphic patterns, which is another popular trend. When they are incorporated into a space in small doses, such as in the art, pillows or drapes, it awakens the space and takes it to another level. I try to steer clear from bringing too many trends into a space or investing too much into something I may not like a year later. I have always had the belief that if you truly love something, whether it’s trendy or not, you will always enjoy it in your home and find a space for it. I never want to get into the habit of buying something because of its popularity. It will be very short lived and a waste of money, if I do. How did you discover AnthologyHouse? I was actually sourcing brass accessories for a design client on Etsy and one of the shop’s pieces came up! I instantly fell in love with the shop’s aesthetic and the amazing finds. I am so happy I found you two!! If you could wish for anything vintage, what would be your ideal pieces? Ooh that's a good one! I have always loved the Saarinen Tulip table and would immediately put one in my kitchen. That would be the perfect spot to sneak away for that cup of coffee! 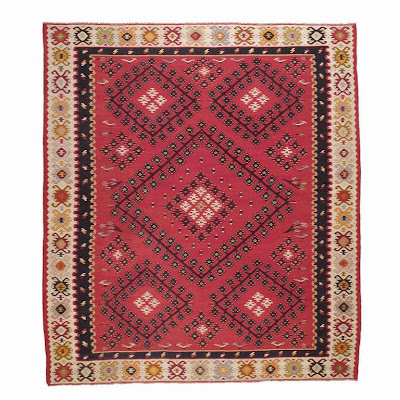 A vintage kilim rug would also be an amazing addition to our home. Hey, I could even put it under the new tulip table! What are the benefits to e-Design and how can clients get in touch with you? I love talking about e-Design! I think it works because it provides the client an opportunity to partner with an interior decorator for a fraction of the cost and gives the client a chance to decorate their room, over time. The entire room plan, including the design board, inspiration ideas, source links and floor plan are all sent through e-mail in a slide show presentation. This allows the client to purchase pieces over time and when the budget permits. The plan is there and ready, when they are! To get in touch and work together, e-mail me at simpledwellings1@gmail.com. I can then send the client form link and information on the design packages! You can also view all of the design packages and see how the process works, on my blog HERE. 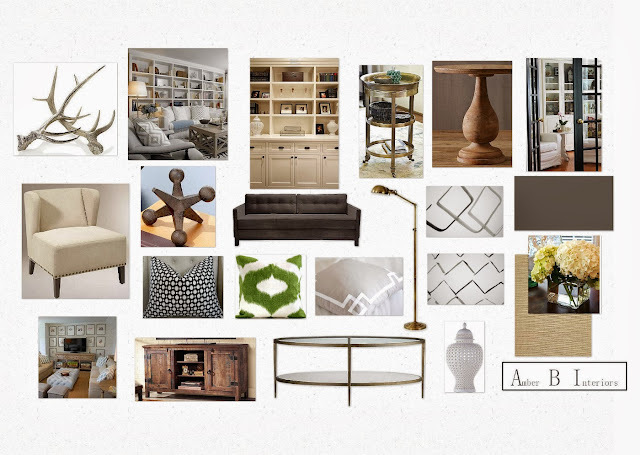 What's next on the horizon for Amber B Interiors? My plan is to continue to grow the design business and blog into the best it can be! My web site will undergo some changes next year, to include a more stream lined look with a new color scheme and web links. The future is exciting, even if I’m not sure exactly where it will take me! I am definitely along for the ride. Interested in being featured in our Customer Spotlight column? Have you styled something fabulous from our shop in your home or office? Send us an email. We'd love to hear from you. Kindly, features are considered based on our customers level of interest in home decor and keen eye for styling photos of items purchased from our shop.